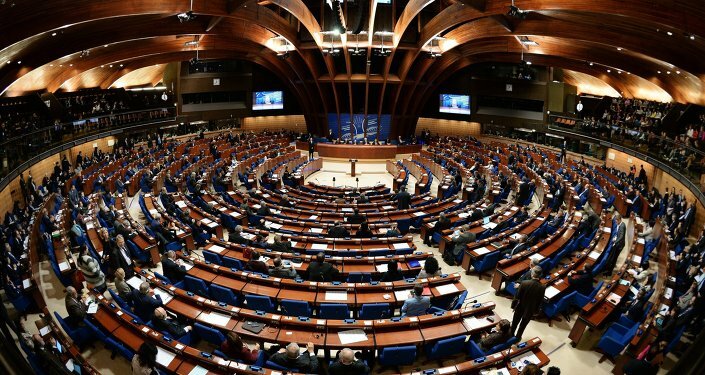 The Russian delegation is unlikely to return to work in the Parliamentary Assembly of the Council of Europe (PACE) by fall, Deputy Chairman of Russia's Federation Council, the upper house of parliament, Ilyas Umakhanov told Sputnik. MOSCOW (Sputnik) — He added that PACE had adopted "a number of resolutions on Russia that cannot be implemented at all." "Will we be able to resolve the issue of the Russian delegation's return to PACE by the fall session? I do not think so. There is no sense in the return," Umakhanov said. At the same time, the leaders of all PACE factions are expected to come to Russia on March 25-27 in order to participate in the 25th anniversary events of the Interparliamentary Assembly of Member Nations of the Commonwealth of Independent States (IPA CIS), Umakhanov added. "All PACE faction leaders are supposed to come to Russia. The visit of the delegation composed of 30 persons is expected to take place on March 25-27 for the 25th anniversary of the IPA CIS in St. Petersburg, where a ceremonial meeting of the IPA will take place," Umakhanov said. He added that such a visit of PACE representatives would be the first ever. PACE adopted resolutions in April 2014 depriving the Russian delegation of the right to vote at the assembly’s sessions, as well as of the right to participate in the work of its three key bodies, linking the move to disagreement with Crimea’s rejoining Russia. In response, Russia left the assembly by the late 2015. Russia did not renew its credentials ahead of the Assembly’s 2016 winter session and made its return conditional on the full restoration of its delegates' voting rights. In 2017, Russia also did not seek accreditation.